A passionate Ghanaian Information Communication Technology (ICT) teacher who was spotted on social media teaching the features of Microsoft Word; drawn on a blackboard has gained the admiration of many. 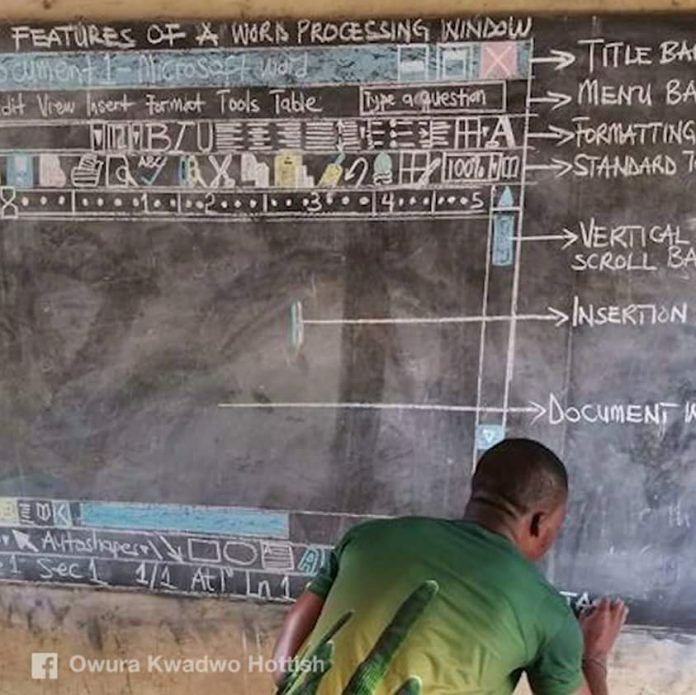 Microsoft Africa amongst the many admirers has decided to sponsor the Kumasi based teacher, who in his quest to make studying easier for his student decided to draw the Microsoft Word page on the board. This move of his, he says was as a result of the lack of ICT facilities in the school to enhance the teaching of the subject. However the teacher, Owura Kwadwo after his lesson is said to have posted a picture of his drawn work on facebook. His post read; “Teaching of ICT in Ghana’s school is very funny. ICT on the board paa. I love ma students so have to do wat will make them understand Wat am teaching. #committedteacher. #ICTontheboard. #Teacherkwadwo”. This post which later went viral was chanced upon by, a Cameroonian entrepreneur Rebecca Enonchong who set out to find the teacher and also sent a message to Microsoft Africa. On her twitter page, the Cameroon entrepreneur is said to have requested Microsoft’s assistance. Fortunately for the teacher, Microsoft replied positively to the message. The response from Microsoft read; “Supporting teachers to enable digital transformation in education is at the core of what we do. We will equip Owura Kwadwo with a device from one of our partners, and access to our MCE program & free professional development resources on education.microsoft.com,” they said. The passionate teacher whose drawing has caught the attention of many Ghanaians has also got many internationals talking about his selfless act. This has left many social media users commenting that, other teachers should emulate what Teacher Kwadwo has done instead of abandoning their roles.